“Mad Merlin” Maddock doesn’t think that’s crazy. He believes in powers deeper and stronger than men or gods, a connecting energy like the oceans. To those powers, healing a broken heart could create a ripple effect in the universe impacting all, even if that heart lives in the alternate dimension of folklore and myth. JP is the first one Maddock plans to send across those lines to bond with the woman he’s always wanted. JP agrees to be his first guinea pig for two reasons. One, Maddock is so damn convincing, and two, the need for her has tripled since he met the guy. If Maddock can send JP into her world, JP will let nothing stop him from claiming her for his own and healing her heart, because he’s sure as hell she’s the missing piece of his. He just has to make sure she doesn’t turn him into lawn ornamentation first. His propensity for light sleeping came in handy. He roused fully at her approach, nearly silent though it was. It took a few minutes of patient waiting, of keeping his breath the same steady rise and fall, before she drew even closer. He inhaled her earthy floral scent and nearly interrupted his smooth breathing routine, thanks to the slight give of his cushioned mat which told him she’d knelt and stretched out on her hip directly behind him. He’d told her he wouldn’t lie to her. Not telling her he was awake wouldn’t fall in that category, would it? For someone as wary as her, yes, it would. “I’m glad you came back to see me,” he said without moving or opening his eyes. From the ripple of air along his back, he realized she’d been reaching out to touch him, and cursed his overdeveloped conscience as she drew her hand away. He grunted, settling his body further. By some miracle, he did talk himself into dozing, probably because drifting back and forth into an awareness of her was a pleasant surprise every time. Then she touched him. It brought him instantly awake, but this time, conscience be damned, he kept his breathing and body the same as if he’d been in the world of dreams. Because this was like a dream. He felt the pads of her fingers and the claws together this time. The curved tips grazed his skin a couple inches above her fingertips. She moved her touch along his shoulder, his back. We never stop wanting things, my lady. We just sometimes stop asking because it hurts too much to not have them. He’d felt that way plenty of times. But he stayed silent, because she wasn’t talking to the conscious him. That smooth worn rope feeling heralded a snake sliding against his upper arm and down to his hip, then it retreated. The other snakes seemed to be keeping their distance and staying still, for he didn’t hear or feel any others. She slid her touch down to his waist and fingered the waistband, the back pocket of his jean shorts. She was obviously intrigued by the way they fit. When that talon slid along the inside of his waistband in back, inadvertently stroking over the crease between his buttocks, he bit back his natural desire to turn and take over. Had she ever touched a man by choice? Without fear? He didn’t know, and didn’t want to stop her. He remembered her chiding him for thinking she didn’t know how to fix a wheelbarrow, or what a ribbon was. Reminders that he didn’t know much more of her life and world than she did of his. He kept his tone mild, slightly teasing, but with the underlying threat still in place. He couldn’t see her face to determine her reaction, but he detected that coveted slight catch of breath, and savored it for the intrigued response he knew it was. 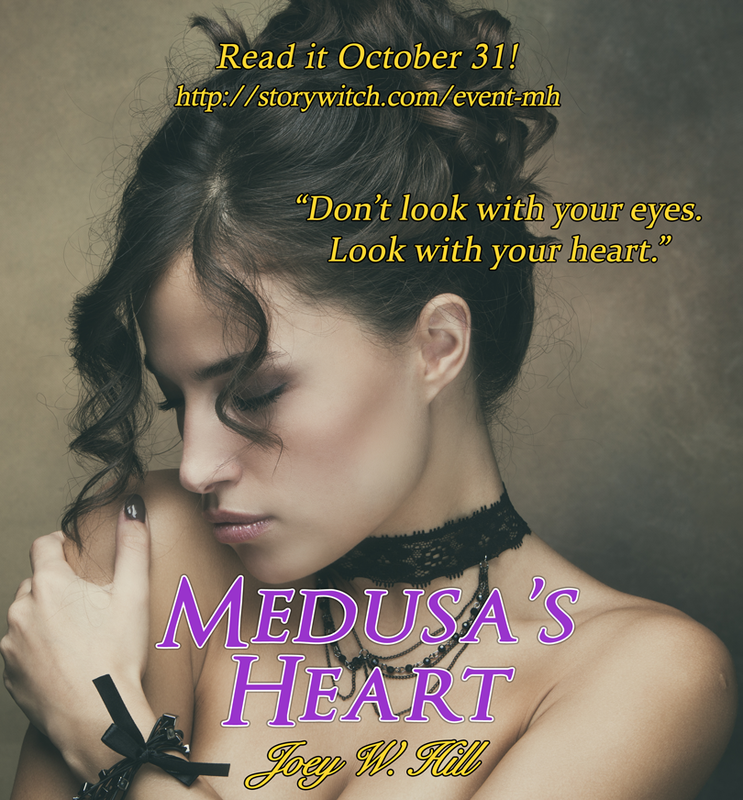 The tattoo between his shoulder blades was a tangle of stylized snakes, artfully arranged around the words Medusa’s Heart. He’d first had it done when he was a teenager, a simpler, less expensive design. He’d had it re-inked by a top-rated tattoo artist within the past couple years, but even when the original design was faded, its message had never dimmed. The heart that beat in his chest was all hers. Medusa was strong and dangerous, with an underlying fragility that called to him. She was a well-shielded, high-powered and damaged submissive soul, the ultimate test for a Dom who craved that challenge. Who craved her. Go big or go home.